Old military surplus wool clothing is great for outdoor activities in cold weather, but the downside is that most of the designs are heavily outdated and often not very practical. That´s why we made this: modern utilitarian and functional design made from proper high quality wool fabric! The M16 wool trousers are designed for manouverability and functionality, without falling into any overly complicated solutions that commonly just makes things worse. The key points here are a good fit, not too baggy yet no too tight either, and a high waist. 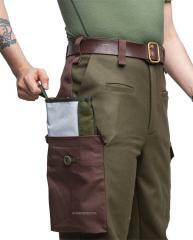 The pocket placement is the classical two large cargo pockets and two side pockets with the addition of two small open slit pockets for tools or phones etc. on the front. Critical points such as seat and knees are reinforced to protect the wool against abrasions from kneeling and moving in rough terrain. 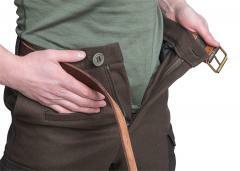 High waist, comfortable to wear even when the going gets rough. A good number of 45 mm wide belt loops. A good number of 1.8" wide belt loops. Zipper fly with a button on top. Usual side pockets on both sides. Small vertical tool pockets on both sides of the fly. 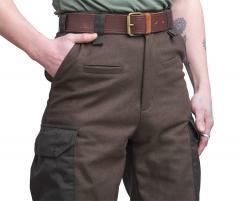 Large cargo pockets with buttons. 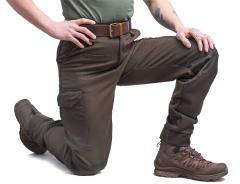 Very roomy articulated knees for unrestricted leg movement. Seat, knees and ankles reinforced to withstand hard wear. This is very simple, Small, Medium etc. for width and Regular and Long for height, followed by recommended user height and trousers waist circumference. Leg inseam: Regular 82 cm, Long 86 cm. Measurements include the wide button adjustable cuff. Leg inseam: Regular 32", Long 34". Measurements include the wide button adjustable cuff. Great pants. 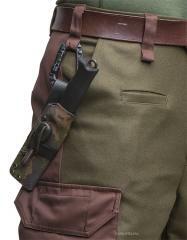 The only bad thing was the buttons on the cargo pockets fell quite soon, but just sew them again properly. You will get pants for quite many years. Warm, smart desing. Recommended. Update!! I have the old model and the buttons in the ankle adjustment were extremely annoying. Now I see you guys put velcro. 5 stars for these trousers. If you are in doubt, I´ll help you: BUY THEM!! Wouldn't want anything else when the winter gets crazy here in Scotland.especially in the north with wind, rain and snow all day. Insanely comfy too. Feel great after a day in the snow and then warming in front of a fire. Happen to look very gentlemanly too. Leikkaus on tosiaan liikunnallinen eikä kinnaa mistään. Koko on mallia erittäin väljä: olen 180cm pitkä ja otin large regular koon joka on 172-178cm käyttäjälle -siltikin tuntuu kuin vyötärö tulisi kainaloihin. EIpä kyllä selkä paljastu missään oloissa ja juuri äsken ulkona räntäsateessa vain nauratti. Korkea vyötärö kyllä melkeinpä vaatisi kaverikseen henkselit -vyö tuntuu jotenkin ahdistavan kun se lähentelee navan korkeutta. Katsotaan,e hkä tuohonkin tottuu. 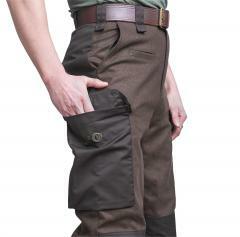 Great pants, high quality wool and of course the stitching is top notch. Do be careful of the sizing, i use these as a breathable outerwear in cold 10-0 F weather. So i got the large in the waist. I wear a 34 waist and the large is perfect to fit over anything else without being too baggy. I stand at 5'11''. My normal pant length is 30-32in depending how high up on the waist i wear. The regular size which the converted said would fit comes up to my ribs (which i actually like for their purpose) but the pantlegs go about 6 inches past my feet. Since they have the puropse of winter outer layer it doesnt matter enough to send back, since the pant gets stuffed into high snow boots or mucklucks. 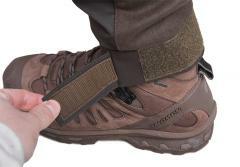 But if you want to use the velcro cuff feature you might consider going shorter then the reccommended length. Mielestäni housujen leikkaukset on huonot. Liian korkea vyötärö ja tuo lahje on auttamatta liian tiukka. Parhaimmat pöksyt kylmälle säälle. Parhaimmat pöksyt talvelle, alkukeväälle ja loppusyksylle. Villa lämmittää silloin kun sen pitää ja hengittää silloin kun sitä tarvitsee. Kesällä vähän turhan lämpöiset mutta kuka näitä nyt helteillä muutenkaan pitäisi? Polvet ja pebba vahvistettu niin ei villa sitten kulu kun kuluttaa omaa takamustaan esimerkiksi nuotion äärellä.